Joe Lockard was born on October 30, 1922, in Williamsport, Pennsylvania. He enlisted in the U.S. Army in August 1940, and was sent to Schofield Barracks, Hawaii for basic training in December 1940. 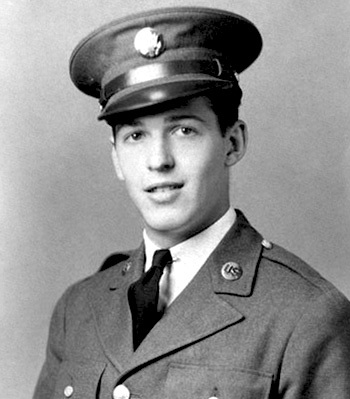 After completing basic training and basic radio operator training, he was assigned to the Army Signal Corps and was then trained as a radar operator. His first assignment was as a radar operator with Signal Company Aircraft Warning Hawaii on Oahu, Hawaii, where he was stationed the morning of December 7, 1941, when the Japanese attacked the Hawaiian Islands. Pvt Lockard reported the radar readings that turned out to be the initial Japanese attack force that morning. He was promoted to Staff Sergeant and returned to the United States in March 1942, and then completed Officer Candidate School, receiving his commission as a 2d Lt in the Signal Corps. After additional radar training, Lt Lockard served as a radar officer on Adak and then Amchitka Island in the Aleutian Islands of Alaska until the end of the war. After leaving active duty, Joe worked for the Pennsylvania Railroad, Sylvania Electric, and then Amp, Inc., where he retired in 1986. Joe Lockard died on November 2, 2012. For exceptionally meritorious and distinguished service in a position of great responsibility. Staff Sergeant Lockard was the operator in charge of the detector unit operated by his organization on the island of Oahu, Territory of Hawaii, on the morning of December 7, 1941. In order that instruction in the operation of aircraft warning equipment might be given to another soldier under training, he, in devotion to duty, remained at his station upon completion of the scheduled operating period. At approximately 7:02 a.m., a signal was detected on his instruments which, in the opinion of Staff Sergeant Lockard, signified a large number of airplanes in flight approximately one hundred and thirty-two miles distant, azimuth three degrees. At that moment Staff Sergeant Lockard was placed in a position of great and grave responsibility to his country. After rechecking the distance and azimuth, Staff Sergeant Lockard promptly contacted the duty officer of the information center and furnished him with complete particulars of the readings. Subsequent investigations have proven conclusively that the airplanes reported by Staff Sergeant Lockard were the large Japanese Air Force which attacked the island of Oahu at approximately 7:55 a.m.